Jonathan Noyce was born in Sutton Coldfield, in the Midlands of England, on the 15th July, 1971, three months after the release of Jethro Tull’s “Aqualung” album. His father, Peter, was Assistant Organist and Choirmaster at Lichfield Cathedral, and his mother, Jane, a town planner. Jon grew up surrounded by the sounds of choirs, organs and the orchestral music which formed the basis of his parents’ small record collection. The call of the big city and the prospect of a life as a working musician brought Jon to London in 1990 to enroll at The Royal Academy Of Music, where he passed his entry examination by playing classical percussion! However, once accepted, he switched to a four year course in the study of bass guitar in the context of jazz and commercial music. In 1995, Jon worked with Martin Barre, on his album “The Meeting” and with Ian Anderson on “Divinities”. 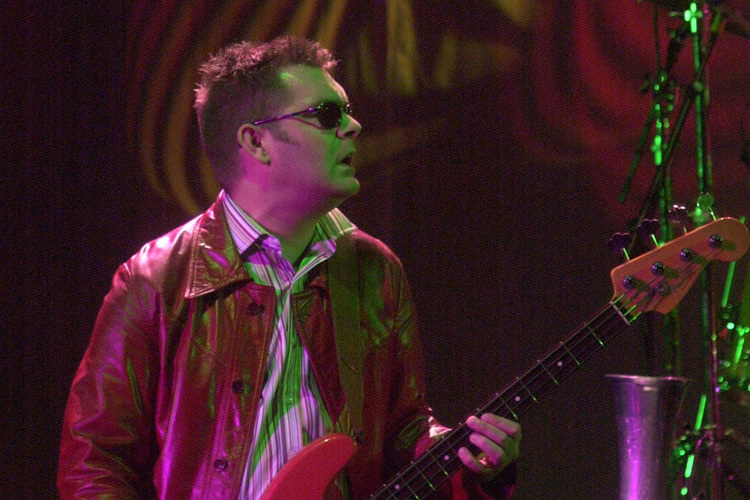 When Tull bassist Dave Pegg announced his retirement from the band in 1995 to concentrate on his original and first love, Fairport Convention, Jonathan was the natural choice as successor. Jonathan has featured on many records as a session bassist , and in live performances with a variety of artists and currently resides in London, England. Outside of Jethro Tull, Jonathan had a long association with guitarist Gary Moore, playing with him on his Old New Ballads Blues CD, the DVD recording of the concert to commemorate the life of Phil Lynott, One Night in Dublin, which featured members of Thin Lizzy and the CD/DVD release of Gary’s final recorded show “Live At Montreux 2010”. In 2006 Jonathan joined The Divine Comedy for some European dates and one off television appearances. Since 2007 Jonathan has been a member of the UK band Archive. He is featured on the recordings Live at the Zenith, Controlling Crowds, Controlling Crowds Part 4 and “With Us Until You’re Dead”. A new album from Archive is due for release later in 2013 on which Jonathan contributed electric bass, Moog synthesiser, overdrive and distortion. Rick Wakeman called upon Jonathan for his concerts at Hampton Court Palace in 2009. These shows were also recorded and filmed and feature on the CD, DVD and Blu-ray release The Six Wives of Henry VIII Live at Hampton Court Palace. In 2010 Jonathan re-united with Gary Moore for his Summer of Rock shows throughout Europe. This band also included drummer and friend Darrin Mooney and, following a 21 year hiatus, keyboard and guitar player Neil Carter, Gary’s right-hand man during his rise to international success in the 1980s. This promising Celtic-Rock project came to a sad and sudden end with the sudden death of Gary on 6th February 2011. The band had been in rehearsals just prior to Gary’s death in preparation for the commencement of recording sessions for a new album later in February that year. 2010 saw Jonathan having one of his greatest commercial successes with the release of French-Canadian superstar Mylène Farmer’s latest CD Bleu Noir for Jonathan supplied all the bass guitar tracks. For somebody normally associated with other musical forms, it’s an unlikely move for Jonathan, but it seems that he was, once more, called on for his bass expertise over his love of Italian footwear and quality hair products. Jonathan filled in on bass for Love Amongst Ruin’s debut gig at Eurosonic Festival in January 2010. 2012 saw Jonathan joining his old Jethro Tull bandmate Martin Barre for live shows across Europe. More shows and recordings are planned for 2013. In 2013, Jonathan toured with Archive. Jonathan Noyce’s main instruments are an original 1960 Fender Precision bass guitar (which has an identical twin, made by Fender Masterbuilt craftsman Ian Waller), Yamaha basses (BB1100s, fretless, BB3000 & BB2025X), Wal basses (custom 4, 4 fretless and 5 string), Fender Musicmaster, a 1964 Fender Jazz bass, an Epiphone Rivoli bass, a Guild Acoustic, Zeta Crossover UEB. Jonathan has two pedalboards made by Custom Pedal Chain System. Both are almost identical, featuring Tech 21 Sansamp Classic, Zvex Woolly Mammoth, Boss OC2, Ibanez CS505, Lehle [email protected] switching and cables by Custom Pedal Chain System. Jonathan has used SWR amplification for over twenty years and his current main live rig uses a SM900 amp and Henry the 8×8 cabinet. In the studio Jonathan uses an SWR Redhead combo, SWR Mo’Bass, Fender Bassman, Ampeg Portaflex and Wallace Amplifier. Di boxes are Radial. Jonathan Noyce strings all his guitars with D’Addario strings.